1. Since your appointment just over two years ago, what’s been your most satisfying achievement? “The most satisfying achievement has been the overall success of Mayor Barrett’s sustainability initiatives. I am also pleased with Milwaukee’s reputation as a ‘green’ city. Each year, Sustain Lane, a nonprofit group that provides information on sustainability practices for individuals, businesses and governments, ranks the 50 largest U.S. cities for their sustainability programs. In 2008, Milwaukee was ranked 12th. This a move up from 16th in the prior ranking. This is an important recognition and shows how well we are doing among much larger cities. 2. What are some specific examples illustrating how Milwaukee is more energy efficient today than two years ago? “The mayor has directed city departments to reduce energy use by 15 percent over the period 2005-2012. By reducing our energy use, we are also reducing our carbon foot print and saving taxpayer dollars. “We have focused on making our buildings more efficient. We’ve worked with Focus on Energy, the state’s energy efficiency program, to conduct audits of our highest energy-using buildings. We’ve implemented efficiency projects as a result of the audit findings. For the municipal building complex (City Hall, the municipal building and 809 Broadway building), we saved $35,000 in the first year and reduced energy use by 9 percent. 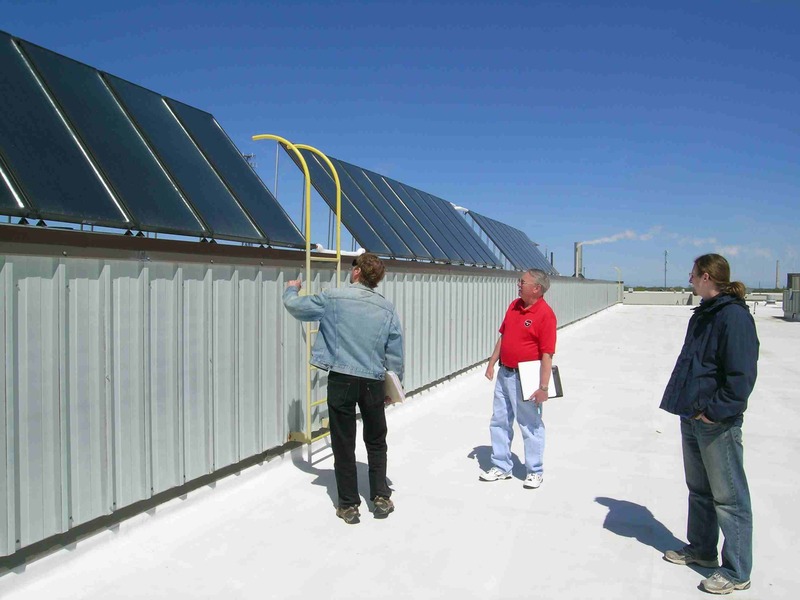 From left to right, Michael Vickerman (RENEW), Paul Milbrath (Wigwam), and Dave Drapac (Seventh Generation Energy) check Wigwam's solar thermal collectors, designed by Energy Concepts, Hudson, Wisconsin. The need for wind energy technician training is not a lot of hot air, said those involved in a conference to be held here on the topic. The summit is expected to draw 50 participants from the industry and technical colleges on Jan. 6-7 at Snap-on’s Innovation Works. The renovated building, on the company’s headquarters site, 2801 80th St., was the production factory until it closed in 2004. Representatives from Lakeshore Technical College in Cleveland, Wis., Texas State Technical College in Sweetwater, Texas, and Iowa Lakes Community College are expected to attend. One goal of the gathering is to designate representatives to be liaisons with lawmakers in Madison and Washington, D.C., where the new administration is expected to be more receptive to clean energy. The liaisons would promote appropriate policies and encourage funding for training and related issues. The group also wants to develop a standard training program that technical schools can adopt and quickly implement to meet the anticipated need for technicians, said Fred Brookhouse, Snap-on’s business and education partnership manager and business development manager over education. There appears to be no formal study of the number of jobs that the young industry would create. The Focus for Energy Web site currently lists 21 installers, including some in Wisconsin, Michigan, Minnesota and Illionois, with a Milwaukee firm the closest to Kenosha. But Brookhouse said the need for technicians to install and service wind energy technology will be evident once the country accepts that our major energy supplies are finite. Sustainable businesses offer products and services that fulfill society's needs while contributing to the well-being of all earth's inhabitants. Sustainable businesses operate across all business sectors: energy efficiency and renewable energy generation, water and wastewater treatment, resource-efficient industrial processes, advanced materials, transportation and agriculture. They create products and services that compete on price and performance while significantly reducing humankind's impact on the environment. . . . Thinking of remodeling or building a new home or business? Want to make your office, a single room, or your whole house more comfortable and attractive while minimizing the harmful effects on you and the environment? Find out about the amazing options now available to you, from energy efficient lighting and natural, sustainable flooring materials to countertops made of recycled materials. Learn about New Urbanism, LEED, USGBC – and what exactly is a VOC? Get inspired by ideas for interior finishes and materials that help create beautiful and healthy places to live and work. Touch and feel samples of today’s eco-friendly materials. Discover how cost-effective it is to be green! We couldn’t agree more. Our slumping economy is taking its toll, leaving all of us with a sense of anxiety about the future. But we have a tremendous opportunity to rebuild our economy across the country and here in Wisconsin, and to do it on a solid foundation. President-elect Obama and the new Congress should enact a green economic recovery plan that makes critical investments in clean energy and green infrastructure to help rebuild the American economy, protect our environment and make us more energy independent. When it comes to clean energy, the Badger State has a unique combination of assets that can help us capitalize on such a plan and lead the way into the new energy future. We have vast renewable energy potential from wind and solar power, the research laboratories to develop new energy technologies, the manufacturing base to build them, and the farms to grow the next generation of fuels. WESTON -- The village Plan Commission on Monday approved an ordinance identifying wind as "an abundant, renewable and nonpolluting energy resource" to respond to growing interest among local businesses. The Village Board could consider establishing rules on wind turbines at its meeting next Monday. Jennifer Higgins, community development director and zoning administrator, said the village does not prohibit energy windmills but needs an ordinance to define what's acceptable. "Right now, we don't have anything," she said. The ordinance would permit "small wind energy systems" that have a capacity of 100 kilowatts or fewer and are no more than 170 feet tall. At least three businesses -- Applied Laser Technologies, K&M Electric and Bullshooters Saloon -- are exploring wind energy as an option. Chris Osswald, president of ALT, a metal fabrication shop, said a wind turbine would allow his company to address environmental concerns and potentially save money. "It's important to how we do things," he said. Mike Ritzel, an estimator and electrician with K&M, is exploring wind as an energy resource on behalf of the company. He's also considering Bullshooters, of which he is an owner, as a possible site to help encourage community interest as electric rates continue to rise. "Nothing ever goes in reverse," he said of energy costs. Whether you have less than a 100-head herd or a large herd, digesters can work for you. Come to the seminar to hear how Dane County and Richland County are using community digesters as well as how to implement a manure digester on a 50-head farm. SUPERIOR — There is indeed a growing awareness of just how precious the Great Lakes are — and will be — in a century in which many are predicting fresh water will become more coveted than oil. The significance of this can’t be underestimated for a system of linked lakes that hold 20 percent of the world’s fresh surface water and 90 percent of the nation’s. Recognizing the lakes’ ecological and economic value, President George W. Bush this fall signed the Great Lakes Compact, which prohibits most water diversions outside the Great Lakes basin. Bush signed the measure after the compact received overwhelming bipartisan support from the eight Great Lakes state legislatures, as well as the U.S. House and Senate. Its passage is the latest example of the region becoming increasingly protective of the lakes. President-elect Barack Obama promised in his campaign to push for $5 billion to help restore the lakes — money he said would be generated by increased taxes on oil and gas companies. And it was probably no coincidence he pitted the health of the Great Lakes against Big Oil. MADISON, Wis. (Dec. 8, 2008) - Focus on Energy, Wisconsin's energy efficiency and renewable energy initiative, announced today the inception of a new renewable energy program called Fuels for Schools & Communities. The new program is meant to help Wisconsin schools and communities save hundreds of thousands of dollars in energy costs by switching from natural gas to heating their buildings with wood or other biomass. "Schools and local governments today are feeling squeezed by energy prices. This new program will allow interested school districts and local governments, especially in the north and southwest portions of the state, the ability to adopt biomass technology as a cost effective and environmentally responsible solution to increasing energy costs," said Don Wichert, director for Focus on Energy's Renewable Energy Program. The new program offers interested schools and communities pre-feasibility studies and feasibility studies at no cost and up to $250,000 toward the implementation of a biomass system. The program complements Clean Energy Wisconsin, Governor Doyle's strategy to strengthen Wisconsin's energy future. This comprehensive plan moves Wisconsin forward by promoting renewable energy, creating new jobs, increasing energy security and efficiency and improving the environment. A recent study funded by Focus on Energy and conducted by the Biomass Energy Resource Center (BERC), "Heating with Biomass: A Feasibility Study of Wisconsin Schools Heated with Wood," found that as many as 25 percent of Wisconsin schools could save hundreds of thousands of dollars in energy costs by switching from natural gas to heating their buildings with wood, or other biomass. Biomass, a renewable resource, typically consists of clean wood chips, wood pellets, switchgrass or other agricultural based pellets. This is a significant finding considering Wisconsin schools spend close to $200 million a year on energy costs. The study concludes that the annual energy costs from wood biomass systems could be 29 percent to 57 percent less expensive than natural gas and save schools between $53,000 and $75,000 annually, depending on current fuel prices. The study included case studies from Barron, Hayward, Shell Lake and Rice Lake, Wis., high schools. MADISON, Wis. (AP) -- State regulators say they are launching a statewide effort to explore how utilities could distribute more solar panels across Wisconsin to take advantage of that renewable energy source. The Public Service Commission said its solar collaborative will study ways to dramatically accelerate the deployment of the panels by utilities. The announcement came Thursday as the commission ordered that there be no increase in electric rates and a slight decrease in natural gas rates for customers of Wisconsin Public Service Corporation and Wisconsin Power and Light next year. The PSC noted that declining fuel costs are a major factor in the move to hold the line on gas and electric rates for customers of the two companies. Transit supporters have taken a couple of hits recently, casting doubt on both the creation of a regional transit authority and system, and the development of a critical element of such a system, a commuter rail line linking Milwaukee, Racine and Kenosha. Nevertheless, the transit authority and the KRM line are still proposals that deserve widespread support if the region wants to build effective regional mass transit that would provide a number of benefits, including fostering economic development. A regional transit system could improve bus service in Milwaukee County and other areas, as well as help create better intercounty connections to help workers get to jobs. The KRM can help provide a reliable speedy mass transit link along the eastern edge of the region from downtown Milwaukee to Kenosha. 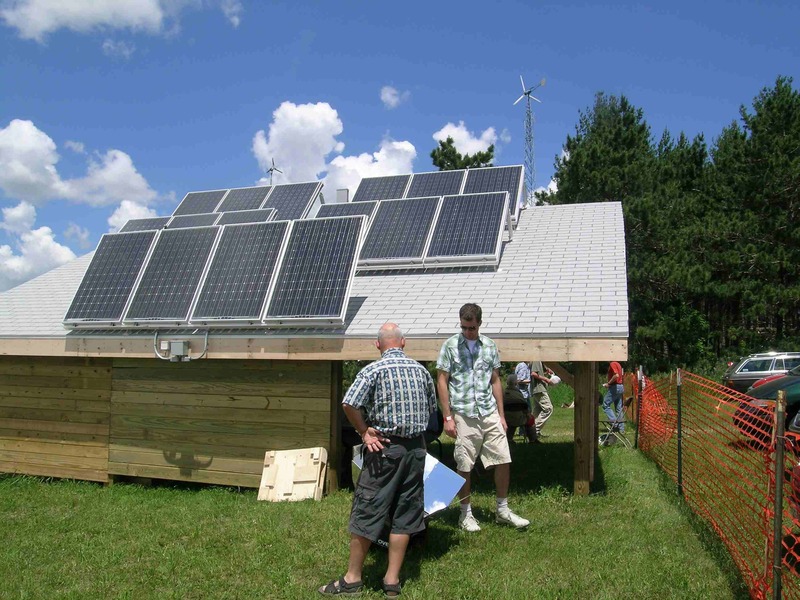 Milwaukee, WI – Through a partnership with Habitat for Humanity and other funders, the Midwest Renewable Energy Association (MREA) is now offering a wide variety of solar courses in the Milwaukee area. These courses range from introductory seminars to hands-on installation training. The MREA has been offering workshops on renewable energy system design and installation since 1990. This new initiative will bring more of this training to the Milwaukee area. “Our partnership with Milwaukee Habitat for Humanity will provide us with rooftops where students can participate in actual solar electric and solar hot water installations,” explains Clay Sterling, MREA Education Director. “We now have the equipment and facilities available to offer a full range of Basic, Intermediate, and Advanced Installation courses.” Over 50 seminars, workshops, and training events are planned for the upcoming year. The full schedule will be on line at www.the-mrea.org starting January 1, 2009. MREA – Milwaukee, 544 E Ogden Ave. Ste 700-225, Milwaukee, WI 53202, 414-303-7351. Watch for the schedule to be posted here after January 1, 2009. More than 2,900 compact fluorescent light bulbs were distributed through the “CFL and Vote!” project by The Eco-Municipality of Stevens Point, Sustainable Stockton and the Commission for a Greener Tomorrow. More than 700 people who received a free CFL had never used one before, and 565 people signed up to get the Central Wisconsin Sustainability Newsletter during this project. The Public Service Commission of Wisconsin (PSC) and other state agencies complete a study of the feasibility of generating electricity from off-shore wind resources in the Great Lakes by the end of 2008. [In response,] the PSC created an external Study Group to examine the feasibility of Great Lakes wind projects. Task was not to determine whether offshore wind is in the best interests of the state, rather to determine whether or not off-shore wind in the Great Lakes is possible. Meetings were open to the public and documents were shared. Materials are available on the PSC website. Click here for the complete presentation in PDF. Momentum is building to pass legislation repealing antiquated exemptions in federal statutes so that antitrust law fully covers railroads. In a letter sent last week to House Speaker Nancy Pelosi, Minority Leader John Boehner, Judiciary Committee Chair John Conyers, Judiciary Ranking Member Lamar Smith, and Judiciary Antitrust Taskforce Ranking Member Ric Keller, the Section of Antitrust Law of the American Bar Association endorsed H.R. 1650, the Railroad Antitrust Enforcement Act of 2007, authored by Congresswoman Tammy Baldwin (D-WI). Their letter follows closely on the heels of a letter that Reps. Baldwin and Conyers sent last month to Speaker Pelosi urging her to include H.R. 1650 as part of the economic stimulus package to be considered in January. Baldwin and Conyers reminded the Speaker that the legislation was reported in April by a voice vote of the Judiciary Committee without opposition and that companion legislation, S.772, authored by Sen. Herb Kohl (D-WI) was reported by the Senate Judiciary Committee, also by a voice vote without opposition. For years, captive shippers have been reporting spiking rail rates and unreliable service. In Wisconsin, for example, Dairyland Power, a rural cooperative provides electricity for approximately 575,000 people in Wisconsin, Minnesota, Iowa, and Illinois. Dairyland’s three coal-fired power plants consume 3.2 million tons of coal per year, 75% of which comes by rail from the Powder River Basin in Wyoming. Over the years, Dairyland has reported deteriorating service quality; at times forcing them to cut back generation due to insufficient coal inventories. Adding further injury, at the end of 2005 the railroad that holds Dairyland captive raised its rates dramatically. Dairyland now pays about $75 million a year to ship $30 million worth of coal. Railroad rate increases have translated into a 15 to 20% increase in electricity rates for consumers. The Public Service Commission of Wisconsin (PSCW) has created a docket to begin evaluating the company’s request to install biomass gasification technology at the Bay Front Power Plant in Ashland, Wis. This represents the first step in the regulatory review process for the innovative project that, if approved, would transform Bay Front into the largest biomass-fueled power plant in the Midwest, and one of the largest in the nation. When completed, the project will convert the plant’s remaining coal-fired unit to biomass gasification technology, allowing it to use 100 percent biomass in all three boilers. Currently, two of the three operating units at Bay Front use biomass as their primary fuel to generate electricity. In 1979, the facility became the first investor-owned utility plant in the nation to burn waste wood to generate electricity. This is the first time biomass gasification technology will be used to convert a coal-fired boiler at an existing base-load power plant. The project will require new biomass receiving and handling facilities, an external gasifier, modifications to the plant’s remaining coal-fired boiler and an enhanced air quality control system and is expected to cost $55-$70 million. RACINE — Bringing a modern amenity to an aging building, contractors Thursday continued installing solar panels on the roof of Walden III School. Between three major grants and several student fundraisers, the community at Walden III, 1012 Center St., raised more than $140,000 in about a year’s time to have 70 205-watt panels purchased and installed on the roof. Walden will sell the electricity generated by the 14.4-kilowatt system back to We Energies at twice the rate the utility sells it for. The profits, estimated at $4,000a year, will be used for more energy-saving projects at the school. Walden has been threatened with closure because of its age, said high school English teacher Tom Rutkowski. One area of the campus dates back to the 1860s. “There is some educational value for students and it’s good for the school to see something new happening here,” said Rutkowski, who helped spearhead the solar project. We Energies contributed $52,000 for the project and also paid for a weather station to be installed on the roof. Wisconsin-based Focus on Energy, which promotes energy-efficient and renewable-energy projects, kicked in a $35,000 grant. And the Kenosha-based Brookwood Foundation, which focuses on education, renewable energy and religious projects, also contributed grant money, although the foundation would not reveal the actual amount Thursday. Educators Credit Union and the Racine Community Foundation are also sponsors of the project. Two visitors at the MREA Energy Fair in June 2008 check out a solar oven on display in front of the MREA's solar training structure. 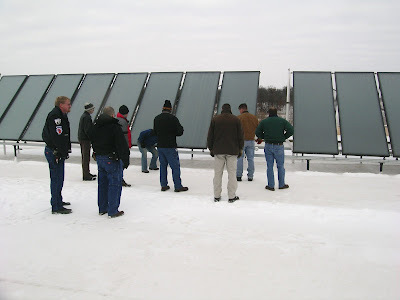 3. are not unduly burdened with unnecessary labor and installation costs. . . .
Based on the collective experience of the solar professionals at the MREA, the best way to ensure the safety of Wisconsin’s citizens (with respect to solar electric systems) would be for the Department of Commerce to require that all solar electric systems be installed by NABCEP certified installers or persons who are legitimately in the final stages of NABCEP certification as recognized by the Wisconsin Focus On Energy program. We believe that requirements of Act 63 can be fulfilled by having a licensed electrician make the final connection to the AC power system. Our many years of experience have shown that the Department could allow NABCEP certification to suffice for the installation and connection of solar electric systems without any compromise to the safety of the people of Wisconsin, if Act 63 allowed such leeway. Installation of safe and reliable small wind power systems (up to 100 kW), also requires a very specialized set of skills that are not taught to electricians. Unfortunately, NAPCEP certification does not yet exist for the installers of small scale wind systems, although it is likely that a certification system will be in place by 2010. When this certification standard is available, Department of Commerce adoption of this standard will be the best route to ensuring safely installed small wind systems. Presently, utility-scale wind systems usually are installed in custom engineered systems by licensed electricians, but utility-owned systems are already exempt from Act 63. As of Friday, gas was $1.68.9 a gallon in Tomah, which is down from $4.06.9 a gallon in mid-summer. That’s an enormous swing, but here’s something that didn’t change: Oil is a finite resource and will be depleted one day. Does anyone believe, barring a Great Depression, that gas will be $1.68.9 a gallon two years from now? When it comes to developing renewable energy sources, there is no time like the present. Fortunately, president-elect Barack Obama plans to make renewable energy a major part of an economic stimulus plan he’ll present to Congress shortly after his term begins next month. It’s important for the government to take the initiative because private markets won’t. There is simply too much price fluctuation, and if we wait for the market to develop alternative fuels and alternative vehicles, it won’t happen until a more expensive crash program is required. The government actually has a good record in research and development. It wasn’t the private sector that developed the atomic bomb, sent a man to the moon or created the infrastructure that led to the Internet. It was all done by government researchers who didn’t have to answer to stockholders who cared more about the next quarter than the next decade. That doesn’t mean the private sector won’t have the largest role in getting alternative energy products to consumers. The private sector is far better equipped to manufacture, market and distribute profitable goods and services than the government. However, it’s the government, not the private sector, that has the luxury of funding research that doesn’t pay off immediately. Research on alternative vehicles and renewable energy needed to power them can’t hinge on the price of gas in a given week. Perhaps the benefits won’t be felt immediately, but clean and renewable energy will benefit Americans long after next year’s stimulus package is passed. STEVENS POINT -- The average American has gained 10 pounds in the past decade, and the extra weight is helping cause climate change. "What that means is that the airlines that crisscross this country burn 350 million more gallons of jet fuel every year, schlepping around that extra weight," said Terry Tamminen. "If all of us, myself included, would lose that 10 pounds, the planet would be better off and so would we." The idea may be a little harsh, but it is the kind of forward thinking Tamminen is known for and has helped him land some of the most prestigious climate jobs in the country. He has worked as the Secretary of the California Environmental Protection Agency under Gov. Arnold Schwarzenegger, and Thursday night was part of a conference call with the transition team for President-elect Barack Obama. Tamminen was Friday morning's keynote speaker at the Wisconsin Climate Change Summit at the University of Wisconsin-Stevens Point. From ideas such as his weight loss theory to broader changes like converting 1.2 million buildings nationwide to more efficient systems, Tamminen shared four steps he believes will stimulate the economy and create a more sustainable country: renewables, efficiency, markets and democracy. A new study by a libertarian think tank claims the projected economic benefits of a proposed Milwaukee-to-Kenosha commuter rail line have been inflated and questions its ridership estimates. But a business leader noted that the author of the study, Los Angeles-based transit consultant Tom Rubin, took a far more positive view of the $200 million project in June, when pro-transit business leaders were pushing the Southeastern Wisconsin Regional Transit Authority to hire him as the authority's consultant. And a regional planner said the commuter rail projections were sound. The Reason Foundation study, being released today, says the transit authority should consider express buses as an alternative to the KRM Commuter Link, which would connect downtown Milwaukee and the southern suburbs to Racine and Kenosha with 14 round trips each weekday. Rubin said his latest study wasn't meant to bash the KRM, but to highlight the advantages of bus options. "We're not saying that KRM is a dumb idea and it should be dropped," Rubin said Monday. "I am not saying that KRM is going to fail. I am saying there are other options that should be studied before you make that commitment." A proposal for high-speed rail service from Chicago to St. Paul - with stops in La Crosse and Winona, Minn. - is gaining new steam, buoyed by new federal interest in passenger rail and an aggressive push from St. Paul-area officials. St. Paul Mayor Chris Coleman and Ramsey County officials are engaging leaders in Winona and other Minnesota municipalities on Amtrak’s Empire Builder line, which they say could eventually be improved to carry high-speed trains if federal lawmakers fund the project as early as 2009. Coleman and others say overhauling the Empire Builder line would fast-track Minnesota’s best bid for high-speed rail, though the proposal may face questions from state officials and Rochester leaders who hope to be included on a new route. A high-speed rail on the Empire Builder line, which runs from Chicago to La Crosse, and up the Mississippi River through St. Paul, was first proposed in a 2004 study by transportation departments in Minnesota and 10 other Midwest states. That study estimated an upfront cost of $1.86 billion to improve the line and proposed running five, 110-mph trains per day on the route. Now, with Amtrak ridership climbing, President-elect Obama and other newly elected Democrats are discussing an ambitious, nationwide effort to fund high-speed rail, possibly as part of a stimulus package focused on infrastructure projects. The sudden prospect of federal support has put supporters in high gear: Mayor Jerry Miller confirmed he plans to meet with Coleman and Rep. Tim Walz, DFL-Minn., next week to discuss high-speed rail. Alternative energy is something officials in the Wausau area say they want to encourage among residents, but properly regulating such technology remains uncharted territory. From wind turbines to solar panels to electric cars, enabling the use of alternative energy comes with benefits and challenges. Kelly Warren, a volunteer with Wausau's Commission for a Greener Tomorrow, said energy alternatives only will be feasible if people and government scale back consumption. "The first thing should always be to conserve," he said. In the meantime, local governments are addressing the issue to varying degrees. Weston's Village Board could consider an ordinance Monday that identifies wind as an important resource while placing height and other restrictions on turbines. Administrator Dean Zuleger wants the village to foster such alternatives, possibly by using money from business development districts. "You have to be willing to be forward-thinking with those folks in the business community that want to give that a shot," Zuleger said. Over the past year, the school district of Osceola has begun to take an inventory of how many ways it’s becoming a “green friendly” environment. Prompted by a state movement for schools to gain certification as “Green and Healthy,” as well as a community interest in becoming more sustainable, the district began to formally address the initiative district-wide. All buildings have a goal of becoming certified as “Green and Healthy” by the Wisconsin Department of Public Instruction. Schools have collected and submitted much data. Many statistics that students and staff tracked were used in earning the titles, from the amount of food waste produced to the temperature of the buildings over time. Buildings also submitted curriculum documentation of environmental education. Finally, each site completed an action and implementation plan for continuing its initiatives. These plans have become a vehicle for communicating with students and staff at each building as to their progress and next steps. One of the most noticeable additions to the district is that of 32 flat panel solar energy collectors installed on top of the Osceola Middle School. “We researched solar options for months, traveling to other educational institutions to find out pros and cons of different systems,” stated Mr. Schmidt. “Last spring, we made a presentation to the school board about the different system options as well as grant funding available for the project. The school board has been extremely supportive and proactive in this area.” In the end, the district received grant monies from Focus on Energy in the amount of $46,960.94 to use for the project. Summit Ridge Energy LLC isn’t yet ready to let a Monroe County Circuit Court ruling kill a 60-turbine wind farm proposal for the towns of Ridgeville, Wells and Wilton. After the company developed the Forward Energy Center wind farm in Fond du Lac and Dodge counties, Invenergy planned to build its next Wisconsin farm on land in Ridgeville, Wells and Wilton. All three towns in 2007 granted Summit Ridge conditional-use permits for the wind farm, but Ridgeville and Wilton vetoed those permits, prompting Summit Ridge to sue. As the case played out, the two towns also passed ordinances requiring wind farms to be set back a half-mile from property lines. Wilton Supervisor Tim O’Rourke said the ordinance leaves little developable space in the town. Monroe County Circuit Court Judge Michael McAlpine at the end of November upheld the two towns’ vetoes, but ordinances and withdrawn permits might not be enough to stop the farm. The development’s estimated energy output is just less than 100 megawatts. Ridgeville Chairman Mike Luethe said he would not be surprised if Summit Ridge increases the capacity to more than 100 megawatts, which, by law, puts project approval in the hands of the Public Service Commission of Wisconsin. If Invenergy is willing to wait, it might not need to increase capacity. Several state lawmakers said the Legislature will try to pass a bill establishing statewide requirements for wind farms, regardless of size. That possibility does not sit well with small communities that passed their own ordinances. But local governments might have an ally in state Rep. Andy Jorgenson, the newly appointed chairman of the Assembly Committee on Renewable Energy and Rural Affairs. The Fort Atkinson Democrat said he sympathizes with local governments on development issues. But he would not commit to opposing statewide wind farm regulations, arguing any developments need to be considered if they can help the state snap out of the economic crisis. West Allis residents will get the chance next week to tell the city if proposed restrictions blow too gently or too hard when it comes to an alternative energy source for local homes. A public hearing will be held at 7 p.m. Tuesday, Dec. 16, on an ordinance that would allow West Allis residents to install mini wind turbines on their properties. The public hearing will come at the beginning of the Common Council meeting at City Hall, 7525 W. Greenfield Ave.
On Dec. 3, the Plan Commission unanimously recommended approval of the ordinance. Earlier this year, resident Conrad LeBeau asked the city to change its municipal code so he could install such a system at his residence. LeBeau, who has long been interested in alternative energy, had purchased a wind turbine with a 46-inch rotor diameter — a device capable of generating about 400 watts of power in a 28-mph wind. In an interview earlier this fall, LeBeau, 65, said he could power his garage and lawn lights with the turbine, but hopes to continue experimenting to someday reduce his energy bill to zero. City officials responded to LeBeau’s request with a proposed set of rules that address safety and noise concerns. Under terms of the ordinance, home-based wind energy systems could only be placed outside homes in certain places. A tower for a wind energy system must be set back 1.5 times its total height from any public road right of way and all property lines and utility lines not serving the property. As proposed, the system could only be located in a backyard, and all electrical wires must be underground. The base of the wind system must be at least eight feet from the ground and the total height could not be more than 60 feet. The system could generate no more than 60 decibels of sound — the rough equivalent of normal conversation, according to the University of Wisconsin’s College of Engineering— as measured from property lines. City officials stressed safety in drafting the ordinance because of West Allis’ small lot sizes and high-density neighborhoods, said Steve Schaer, planning and zoning manager. LeBeau said he shared those same concerns, but he also wanted the city to keep costs and restrictions at a minimum to give homeowners flexibility. MADISON - A Canadian renewable-energy company says it plans to build biogas facilities in Wisconsin and elsewhere that would use manure and rendering industry byproducts to produce electricity. Ontario-based StormFisher Biogas plans to build one Wisconsin project in 2009 and two or three more between 2010 and 2012, according to StormFisher Biogas development manager Chris Amey. It plans to partner on some of the projects with Sanimax, an animal byproducts company with facilities in DeForest, Abbotsford, Evansville and Green Bay. Amey said StormFisher plans to build the facilities on farms with at least 2,000 cows. Each project would cost $15 million to $25 million and would create 12 to 20 full-time jobs. Amey said the company is still finalizing agreements with dairy producers, so he couldn't reveal where the farms are located. But he said the 2009 project would be in central or northwest Wisconsin. The start of a commuter rail line between Madison and Milwaukee, a new UW-Madison medical research tower and expansion of Interstate 94 are among the local projects Gov. Jim Doyle says could be started within months if federal lawmakers pass a massive economic stimulus bill for states. Doyle met with members of President-elect Barack Obama's economic team and incoming chief of staff Rahm Emanuel on Wednesday and presented them a list of those and other projects he says the state has ready to go, his office said. Over all, the state has nearly 1,800 projects worth $3.7 billion that could be ready to start within 120 days if it receives funding under the bill being worked on in Congress — though it's too early to say how much Wisconsin might get. "These are things we could do immediately to have people work all across the state," Doyle said earlier this week in an interview. Doyle's office has an additional $10 billion in longer-term projects cued up, including $519 million for the rail project, $300 million to replace UW-Madison's Charter Street plant and $50 million for a campus bioenergy research facility. The office released the list of projects Wednesday. Doyle is slated to testify before the House Appropriations Committee today and he was scheduled to meet with its chairman, Rep. David Obey, D-Wausau, privately Wednesday. Click here for the full wish list, including more items for Milwaukee and southeastern Wisconsin. WITHEE, Wis. — Joe’s Refrigeration, Inc., a family-owned business that designs and installs custom milking and refrigeration systems for dairy farms, has earned Focus on Energy’s Award for Excellence in Energy Efficiency for its efforts to promote energy-saving, environmentally friendly equipment. Working in partnership with Focus on Energy, Wisconsin’s energy efficiency and renewable energy initiative, Joe’s Refrigeration helps dairy producers and processors cut energy consumption and costs by installing efficient equipment such as refrigeration heat-recovery tanks and plate coolers. The resulting savings helps farmers stay profitable and competitive as energy costs continue to rise. “While milk prices have risen, so too have the costs of feed, fertilizer and fuel. Wisconsin’s dairy industry is important to our economy and we’re glad to help farmers stay competitive,” explained Rich Hackner, sector manager for Focus on Energy’s Agriculture and Rural Business Program. Over the past 50 years, Joe’s Refrigeration has expanded and diversified from its beginnings as a refrigeration business. Over the years, the company branched into the dairy industry, a side of the business that has doubled in the past year as more and more farmers have sought financial savings through energy efficiency. If you’re looking at doing business in parts of southwest Wisconsin, you’d better make it as green as possible. Environmentalists, organic farmers, citizens groups and an increasing number of elected officials have made it clear that the environment needs to be part of any business equation. That was clear in recent protests over a coal ash dump site in Vernon County, which eventually led to Dairyland Power scrapping plans to establish the landfill. It became clear again in similar opposition to a coal blend power plant in Cassville. The PSC rejected plans for that plant. It was clear over a year ago when hundreds protested establishment of a large pig farm, which would house more than 1,000 animals as a CAFO (Confined Animal Feeding Operation). Plans for that farm did move forward. Two more examples came to the forefront in recent weeks. Petry Trust of Rockford, Ill., is doing a preliminary investigation into possibly locating a 1,000-plus animal unit dairy in Vernon County. Just a day or so after that story broke, Organic Valley, a successful organic food cooperative, announced it is talking to Western Technical College and Gundersen Lutheran about erecting two wind turbines in 2009 at its Cashton distribution center. That announcement was made at a press conference in La Crosse on the Homegrown Renewable Energy Campaign. It was launched by Wisconsin Farmers Union, Clean Wisconsin, the Michael Fields Agricultural Institute and RENEW Wisconsin. The owner of Petry Trust, Jeff Petry, owns "significant" amounts of agricultural real estate in Wisconsin and Illinois and has farmed himself in the past. Petry leases most his agricultural real estate and owns one other dairy facility in the Darlington area. Bourgault said Petry owns the facility in Darlington, but leases it to a California company. The Darlington facility is permitted through the DNR for up to 2,500 animal units or about 1,800 dairy cows, but there are currently not that many animals on the property. The testing for the possible Vernon County dairy operation will begin at one of the possible sites along West Smith Road, where Petry owns about 300 contiguous acres. A spokesman for Petry said the site would be selected with a number of factors in mind and with all state and local regulations taken into consideration. Opposition to so-called “factory farms” has been strong in the past. Concerns are for the amount of manure produced by such farms, storage of the waste in winter and possible runoff. Parts of the Driftless Area are susceptible to pollution from runoff because of the karst geology in the area. Organic Valley’s proposal is the latest in that organization’s emphasis on the environment and sustainability. The co-op’s headquarters in La Farge and distribution center near Cashton are both “green-built” buildings. Other measures are regularly taken to promote sustainable agriculture by the co-op. BEST Energies Inc., which has a biodiesel plant in Cashton, and the village of Cashton also might become partners with Organic Valley, Western and Gundersen Lutheran in the wind turbine project. The Homegrown Renewable Energy Campaign promotes four of the initiatives recommended this year by Gov. Jim Doyle’s Global Warming Task Force: create a Biomass Energy Crop Reserve Program to pay land owners to plant bioenergy crops such as switchgrass that can be used for fuel, create a Renewable Fuels for Schools and Communities Program to help fund sources for biomass heating systems in schools and government buildings, develop a program to set utility payment rates to fairly compensate small renewable energy producers and set a low carbon fuel standard. Southwest Wisconsin rapidly is developing into a hotbed for those, and other green business practices. If the Petry dairy operation makes sure it takes all the precautions to avoid problems with runoff and other environmental issues, it will be welcomed into the area. If not, it will likely face stiff opposition. The capital cost of developing Milwaukee-Madison train service has soard 25% to 50% in just two years, according to the Wisconsin Department of Transportation. The cost was estimated at $400 million when the 2007-09 budget was developed, according to the agency’s budget request. WisDOT is seeking $40 million in new bonding authority for the project, on top of the $82 million in authority it already has. The good news, WisDOT said, is that there now is a federal funding program for intercity passenger rail service that could pay as much as 80% of project costs. There are good reasons to proceed with the project, WisDOT said. Norm-E-Lane Dairy Farm to purchase the energy and capacity from their anaerobic digester “cow power” facility located in Clark County (Chili, Wis.). Norm-E-Lane is owned by the Meissner family, members of Clark Electric Cooperative. 500 kilowatts of renewable energy, capable of powering 336 homes throughout Dairyland’s four-state service area. Cow manure is collected and heated in the digester tank, a process that creates methane gas. This biogas fuels a large engine to produce renewable electricity. The process also has additional environmental side benefits, reducing animal waste problems associated with manure disposal on farms. Odor is nearly eliminated, and weed seeds and pathogens are killed during the digestion process, thus reducing the need for herbicides and pesticides on the farm. Also, a useful byproduct is bedding that can be used in the dairy. Norm-E-Lane is the fourth dairy farm providing “cow power” to members in the Dairyland system. “We continue to seek opportunities to expand our renewable resources and appreciate working with the Meissner family and Clark Electric to bring this environmentally-friendly energy resource to our members,” said Bill Berg, Dairyland President and CEO. WPPI has been awarded Green-e Energy certification by the Center for Resource Solutions (CRS) for WPPI’s renewable energy programs, including Green Power for Business and its companion program for residential customers. Green-e Energy is a renewable energy certification program established by the nonprofit CRS to provide an objective standard for consumers to compare renewable energy options. Both programs enable customers to make voluntary purchases of renewable energy from WPPI member utilities. By purchasing WPPI renewable electricity, customers will support currently available renewable resources as well as aid the development of new renewable resources. WPPI serves the utilities in the following Wisconsin cities: Algoma, Black River Falls, Boscobel, Brodhead, Cedarburg, Columbus, Cuba City, Eagle River, Evansville, Florence, Hartford, Hustisford, Jefferson, Juneau, Kaukauna, Lake Mills, Lodi, Menasha, Mount Horeb, Muscoda, New Glarus, New Holstein, New London, New Richmond, Oconomowoc, Oconto Falls, Plymouth, Prairie du Sac, Reedsburg, Richland Center, River Falls, Slinger, Stoughton, Sturgeon Bay, Sun Prairie, Two Rivers, Waterloo, Waunakee, Waupun, Westby, Whitehall. "Pragmatic Construction is building two sustainable homes in the Riverwest neighborhood of Milwaukee. These homes are targeting LEED-H Platinum certification," including passaive solar design and options of solar hotwater and solar electricity, according to its Web site which calls the company a "green design-build firm specializing in the integration of multiple green principles and technologies."